Major Million Jackpot - play with free bonus and win over $1,000,0000! Some players can think that there is only one good jackpot in Microgaming Casino – Mega Moolah, but that’s not true. This software provider offers at least 15 classy jackpots with huge prizes and one of them is Major Millions progressive slot. We can call it “millionaire maker” since it offers millions of dollars in the prize pots. It really enjoyable and thrilling, wanna try it? The first thing you should know is that there are two versions of Major Millions. The first one has 5 reels and it will be reviewed in this article, and the second one is 3-reel game with 3 paylines. You can play both of these slot machines (the same max ber of 3.00 coins) if you want to hunt for the progressive jackpot as both offer the same main prize. As it suggests Major Millions is a soldier-themed slot game that has 5×3 reels and 15 paylines. It can be played for as little as 0.20, but to cover all paying combinations you have to invest 3.00 coins, and this will entitle you to the jackpot. The “army” slot is full of military-related symbols including medals, the Major’s Cap, a bomber airplane, a tank, a top secret envelope, binoculars, a large warship and golden bars! There are none of the card low symbols (eg. 10, J, D, K, A) on the reels which make the game outstanding. Major Millions also offers a full suite of other features. The first is that you can play the game in the so-called “Expert” mode, which has autoplay functionality. At the top of the game screen, you can see the current progressive jackpot amount. This money is available to win at any time, and it can be you! To generate a basic win you need to have 3 of any of the symbols on the first three reels, though if you have 4 or 5 of the same symbol on any of the paylines, your win skyrockets. For instance, 3 Major Millions icons get you 15 credits, but land 5 on a payline and scoop 1,000 chips. There are scatter symbols in Major Millions and they are presented as word “Scatter” on the explosion icon in the background. These symbols can appear anywhere across the reels to unlock a win though you do need to have at least 3 to earn a cash reward. All scatter wins are multiplied by a number of coins you used for betting. Another special symbol in Major Millions is a Wild symbol, which is a logo of the game. Firstly, it substitutes for any other symbol in the game to create the best winning combo. Secondly, all winnings from the paylines with Wilds, will be automatically tripled. Better yet, land 3 Major Millions Wilds and you instantly earn 80 coins, 4 lands you 280 coins and all 5 across the first 14 paylines will give you the base game jackpot win of 8,000 coins. That’s not all! When you land 5 Wilds (the bottom left corner – 1st reel, the middle symbol – 2nd reel, the bottom symbol – 3rd reel, the middle symbol – 4th reel, and the bottom symbol – 5th reel) you will trigger the massive Mega Progressive Jackpot. After that, you will that your balance shows an enormous amount of millions of dollars! 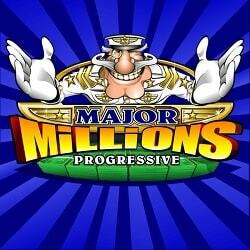 Major Millions is one of the most played jackpots in Microgaming Casinos. It is available for both, desktop and mobile gamers. The game looks very good, it’s very enjoyable yet profitable, even for cheap-dealing users. Just imagine that you can bet with $3 and stand a chance for $3.000.000! All in all, we recommend this for all slot fans.